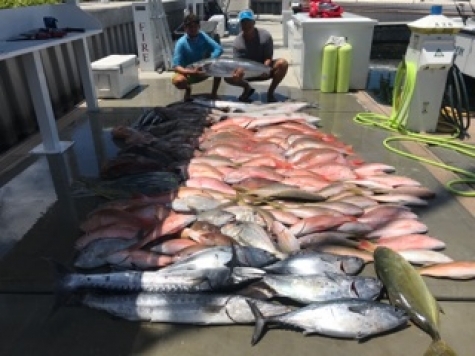 Fishing in the dry tortugas with 2 Fish Charters, a trip I do every two year with some friends. This trip we killed the mutton snapper filling the boat with 60 muttons and some really nice black groupers. We caught over 800 pounds of fish overall so we are going to be eating fish for a while. 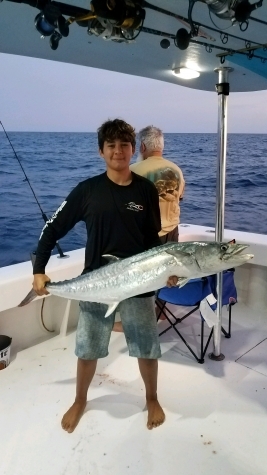 We caught a variety of fish and my PB smoker Kingfish of 45 pounds and some smaller ones two. If I didn't have bullbuster on my side I would have not been able to do so good. We started the Morning fishing for kings around 5am with live goggle eyes on stinger rig’s I had made. We caught the gogs the night before around 2am and we had at least 15 in the live well. I put out three flat lines, put them on balloons and one deep down in the water column. I did the same thing every morning we were out there. I think we did pretty good caching kings. One of my friends got one a tad smaller but overall we did pretty good. We left on a 4 day trip leaving Thursday afternoon and getting back to the dock Sunday afternoon. Fishing for snapper and grouper was a blast especially when you have a great captain that puts you on the fish. Limiting out on mutton snapper and yellowtail was awesome. Flags between 22 inches to 26 inches the ones under 22 we would throw back. We caught most of the snapper with gogs that we ordered from Anglers Bait and Tackle in Dania beach and thanks to them we caught are limit. 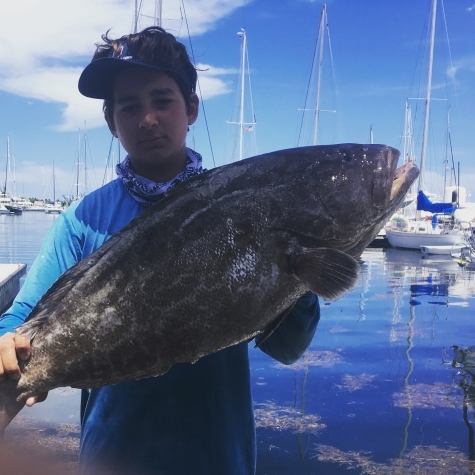 Vertical jigging produced a few of the blacks ad red grouper as well. Thats one of the that we caught, cant wait till next year. thanks to bullbuster fishing line.